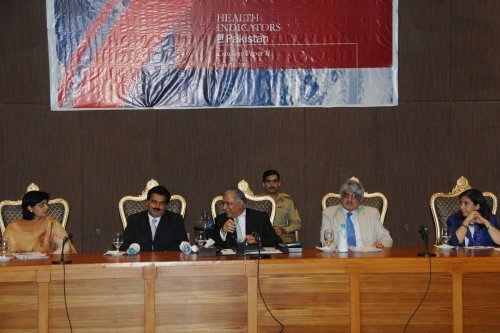 Gateway Paper II – Health Indicators of Pakistan was launched by former Prime Minister of Pakistan Mr. Shaukat Aziz on June 26, 2007. Authored by Dr. Sania Nishtar, Gateway Paper II builds further on the first to provide the evidence base for health reform by tracking health indicators since 1947 and presenting a consolidated review of the health status of the people of Pakistan. It also analyzes weaknesses in the current health information systems and is recognized as a template for periodic reporting of health indicators in the country. (L to R) President Heartfile Dr. Sania Nishtar, former Federal Minister for Health Mr. Mohammad Nasir Khan, former Prime Minister of Pakistan Mr. Shaukat Aziz, former Advisor to the Prime Minister Dr. Salman Shah, and acting WHO Representative for Pakistan Dr. Rayana Bouhaka.